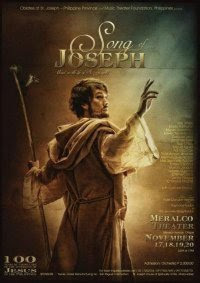 Last December, I invited you to watch a musical called "Song of Joseph" as a wonderful pre-Christmas show to watch. Now, during the Lenten Season, it is only fitting to have another staging of this musical - the first original Filipino full-length musical on St. Joseph. Books and lyrics by Fides Cuyugan-Asensio, music by the husband and wife tandem of Raymond and Mar Jeannelle Roldan. Catch the one night only show on March 7, 2010, 3:00 PM at the Cultural Center of the Philippines. Ang ganda siguro nito. These are events that I wish I had the chance to watch. Thanks for the info.